If you find yourself at the salon every six weeks paying north of $300 to get your hair color just right, you’ve likely wondered at one point or another how to dye your hair at home. It’s daunting, but with patience it can be easier than you think — especially if you’re doing a single hair color or simply covering up stray grays (rather than a full head of highlights or complicated ombre hair color). To find out exactly how we should go about dying our hair at home, we turned to Estelle Baumhauer of eSalon, a site that specializes in individual hair color with personalized instructions. 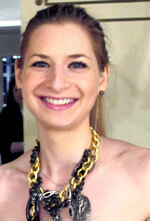 Read on for Estelle’s tips for mastering at-home hair color like a pro. Choosing a hair color shade can be tricky, but it’s not impossible. I suggest choosing a shade close to your natural or your dyed hair color. Over the years, I’ve noticed that clients generally tend to select a shade or two darker than their actual hair color, so I’d recommend picking a slightly lighter shade. Always read your hair color instructions prior to mixing up your color. It’s imperative when working with professional-grade dye since processing time is incredibly important. For example, adding five more minutes when processing a root touch-up can make a huge difference for covering gray hair. Hair color application is just as important as shade selection. I guide my clients to make their at-home application like a salon and use the application techniques of a professional. I suggest using plastic clips, a plastic bowl and a hair color brush for a more precise application. Start by sectioning the hair into four quadrants and clipping each quadrant with a clip. Unclip one section of hair and gently apply color using your applicator brush for a clean, even result. A hand mirror will help you see the roots at the back of your head. Once done with a section, clip it back into place and proceed to the next section until you have colored all four quadrants. This technique will help you achieve a simple, clean application. In a salon, the real magic happens at the shampoo bowl. You can borrow a colorist’s technique that we call the “Shine and Rinse” in the shower. This technique helps remove color from the hair and adds glossy high shine. To master the “Shine and Rinse,” with gloved hands add a little bit of water to your leftover hair color. This mixture should be roughly even parts of hair color and water. Loosen hair color from skin on your forehead and/or near your hairline by rubbing the area in a circular motion. The color will appear to smear and lift off the skin. Pour the water-diluted hair color over your hair and massage the mixture into your scalp. This will help loosen any excess hair color. Continue on to your ends and start massaging the mixture throughout your hair, like how you would shampoo, until the hair color feels creamy. This should take a total of two minutes. Rinse your hair thoroughly until the water runs clear. Lots of times, I have found clients simply rinse out their hair color. 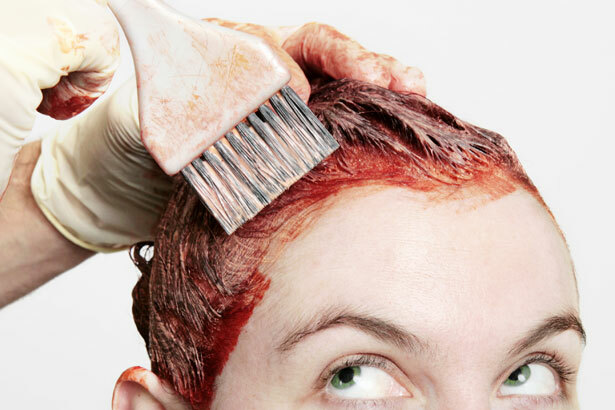 It may seem counterintuitive, but make sure to shampoo the hair after rinsing out the hair color. A good shampoo will help to remove any leftover color in the hair and prevent any scalp irritation without affecting the color that was just applied. Make sure to use a color-safe shampoo and conditioner.